Art of Food Surprise Giveaway! We have an incredible surprise giveaway for you! 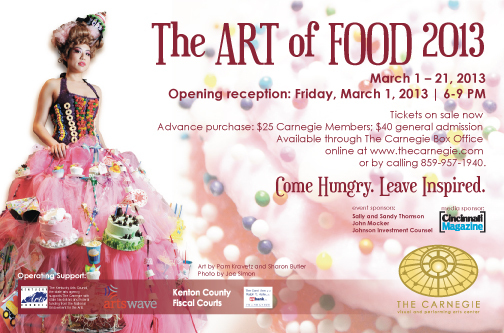 The Carnegie, which originally housed the Covington Library, has given the Kenton County Public Library two tickets to the Art of Food reception to give to one of our lucky readers. The seventh Annual Art of Food exhibition opens on Friday, March 1 with a reception. Popular with foodies and art lovers alike, this exhibition examines the mouth-watering world of food as demonstrated by the culinary inspired creations of local artists and top chefs from across Northern Kentucky and Greater Cincinnati. The Art of Food celebrates that food can be a complete sensory experience and explores the ways in which food comprises an art form. The opening reception will take place Friday, March 1 from 6pm-9pm in The Carnegie Galleries. During the opening attendees will have the opportunity to sample edible creations by more than twenty of the area’s top chefs while feasting their eyes on the culinary-inspired artistic works of artists Kelly Romer Armstrong, Eric Brass, Leah Busch, Valerie Escobedo, Timothy Gold, Sandra Gross, Dorie Guthrie, Debbie Hook, Joyce Kaufman, Rosie Kovacs, Pam Kravetz, Frannie Kroner, Carla Lamb, Megan Lemay, Carole Lichty-Smith, Trinidad Mac-Auliffe, Cheryl Metzger, Carla Morales, Becky Norris, Karen Saunders, Lori Siebert, Sheida Soleimani, Jenifer Sult, Jeff Sutherland, Katie Swartz, Amy Swoboda, Tom Towhey and Jen Ustick. Restaurants include Pizza Bomba, Fireside Pizza, Otto’s, Cumin, Nicholson’s Gastro Pub, Virgil’s Cafe, Senate and many more. Cost to attend The Art of Food opening reception is $25 for Carnegie Members and $40 general admission, in advance; $35 for Carnegie Members and $50 for non-members, at the door. More than 600 guests are expected to attend the opening. We’ll be randomly choosing our winner on Monday, Feb. 25 at 12 pm. The winner will be emailed and announced on the Library Facebook page. The winner has 24 hours to reply or another name will be drawn.You can enter to win two tickets to the reception by commenting on this post with the following information. You must do number 1. For extra entries, you can do number 2, 3 and 4! Be sure to comment separately for each entry. 2. Become a fan of the Library Facebook page. 4. Give this contest a shout out…tell your friends via Facebook, Twitter, text, email or even and old-fashioned phone call! Then tell us how you spread the word. Employees and immediate family members of the Kenton County Public Library and the Carnegie cannot participate in the contest. Disclaimer: We were given these tickets from the Carnegie to give to one lucky reader.